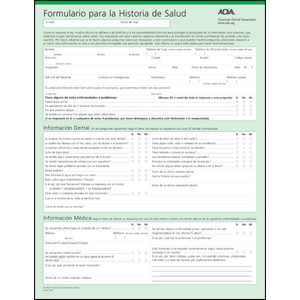 This 2007 edition of the Spanish-language ADA Health History Form reflects the latest AHA premedication guidelines. Clear 2-sided layout and simple wording make form completion easy. Includes questions related to intravenous bisphosphonates and alendronates. Also available as a downloadable version (S501D) for posting on practice web sites. Pad of 100 8-1/2 x 11 sheets.